Here’s why Google Sky is going to change astronomy as we know it: Because an astronomer like Alasdair Allan can spend an afternoon converting an astronomical events feed into KML, and suddenly millions of Google Earth clients can spatially visualize these. 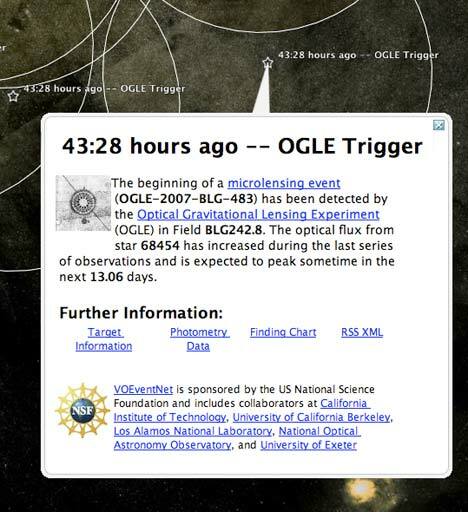 His events feed project, VOEvent, has its home page here, whence you can now get a live KML network link for Google Sky. Suddenly, the sky has turned into a huge canvas, ready to be updated in real time via KML.